4 New Metrics And 5 New Widgets! Although it’s the holidays, we’re working hard (as usual! :)) on adding new features, implementing your suggestions, and fine tuning our systems! So what have we added today? Sharpe Ratio – The Sharpe ratio is used to characterize how well the return of an asset compensates the investor for the risk taken. The higher the value, the better. AHPR – Arithmetic Average Holding Period, or AHPR, is the average holding period return. GHPR – Geometric Average Holding Period, or GHPR, is the geometric holding period return. A system having the largest GHPR will make the highest profits if compounded. A GHPR<1 means that the system will lose money if compounded. Avg. Trade Time – average trade time. Since we keep adding more and more metrics, we’ve felt it was necessary to redesign a bit the advanced statistics for easier reading and interpretation, so no need to panic if the old metrics are not in its usual location :). The new statistics will become available after the next account update. Keep in mind the widgets are self updating, so it’s a great way to promote yourself and have your performance always up to date, displayed in your or other’s website, blog or forum. Posted in Myfxbook Updates | Comments Off on 4 New Metrics And 5 New Widgets! The Risk of Ruin table (under ‘Advanced Statistics’) will show you the probability of losing a certain % of the account (ranging from 100% down 10%). It will also tell how how many consecutive losing trades are needed to reach the selected loss. For easier interpretation of the table, you can simply hover over the selected column and a short sentence will appear explaining the numbers. P.S. If you can’t see the new metrics, please clear your browser’s cache. dbFX is now fully supported with Myfxbook! We’ve combined the FXCM publisher and dbFX publisher into one setup file (Old version of the FXCM publisher will keep working properly). 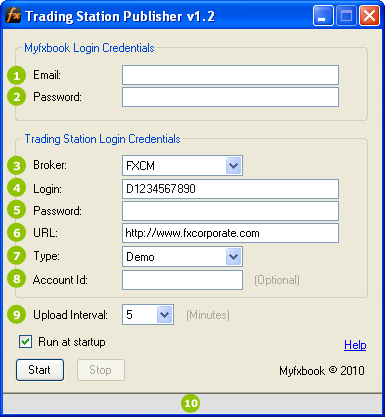 You are currently browsing the The Myfxbook Blog blog archives for December, 2010.